This amazing animal park, both an aquarium and a zoo, in the north of the island is Tenerife's top attraction. The entrance fee is not cheap but considering you get a full day out, the ticket is good value. The dolphin and orca shows are particularly thrilling and the penguins even have their own glacier to cavort on. There are also sea lion and bird shows to enjoy. Animals in the park include gorillas, tigers, alligators, chimpanzees, jaguars, marmosets, otters, sloths and meerkats, each in a lovingly maintained micro-climate. The park was originally established as a sanctuary for parrots and these colourful and characterful birds are still one of the highlights. Loro Parque just might be the most entertaining and ecologically sound zoo you will ever visit. For those planning on going to Siam Park, a combined ticket is available that provides a good discount on entry. There are at least seven restaurants and bars strategically placed in the park for rest and refreshments, but if you want to save money you can bring your own food and drink. For those watching the budget there is also a free train to catch from Puerto De La Cruz. 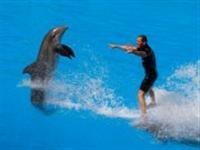 Loro Parque has received numerous awards and generally receives rave reviews from visitors. Opening times: Daily 8.30am to 6.45pm. Admission: €33 (adults); €22 (children aged 6 to 11); children under 6 free.